During summer break, we haven’t been standing still and took teachers’ feedback and used it to create some great improvements for Gynzy. In this blog post we will give you a short introduction of one of the new features and will inspire you how to use it in your classroom. The new powerful tool we would like you to meet is the infinite cloner. Mr. Matthew sent us the feedback that he would love to have a duplication machine in Gynzy: “A key tool that we need is the feature called ‘Lock and Clone’. This one feature can be used to create hundreds of different learning experiences. The way it works is to select a picture or object and choose ‘lock and clone’. This then turns that graphic into a picture-making duplication machine. For example this could be used for students to ‘count out’ money to practice addition/money skills”. Based on his, and many other teachers’ feedback, we created the infinite cloner. You’ve always been able to make copies of objects in Gynzy. However, our new infinite cloner makes it easier to copy shapes and images as many times as you want. Simply, by clicking an object with this feature enabled, then dragging away the copies until you have the desired amount. The possibilities of the infinite cloner are endless. For example, the infinite cloner makes it is as simple as ever to make an exercise for creating, identifying or continuing a pattern. Our new lesson, Pattern Making, will help your students recognize, complete, and create patterns. First, students have to recognize a repeating pattern and then finish it. The infinite cloner makes creating these patterns as easy as a click and a drag with your mouse or finger. Try this new lesson out! Another great example is a matching game, in which the students have to match the right words with the corresponding images. With a group of cloneable objects underneath, students can simply pull up a copy of the image to the correct space while leaving the original image in place. 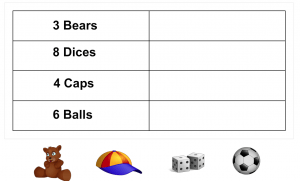 With Gynzy’s chartmaker and image library you can easily create any matching game you want. How do you use the infinite cloner in your classroom? Share it with us in the comments! You can find the infinite cloner by selecting the object you’d like to clone and choosing the + button and select the infinite cloner option. Now you will be able to clone your object by clicking the cloned image and drag it to a new spot. By dragging the image you can clone that image as much as you want. Click on the video below to get a visual representation of the function. Have fun using the infinite cloner in your classroom! You can help improve Gynzy! If you have more suggestions or improvements for Gynzy, do not hesitate to contact us. Leave a message on our feedback forum!